Jimmy Terry, billed as the world’s greatest rope walker, recently walked between two Chicago buildings 39 stories above the ground. 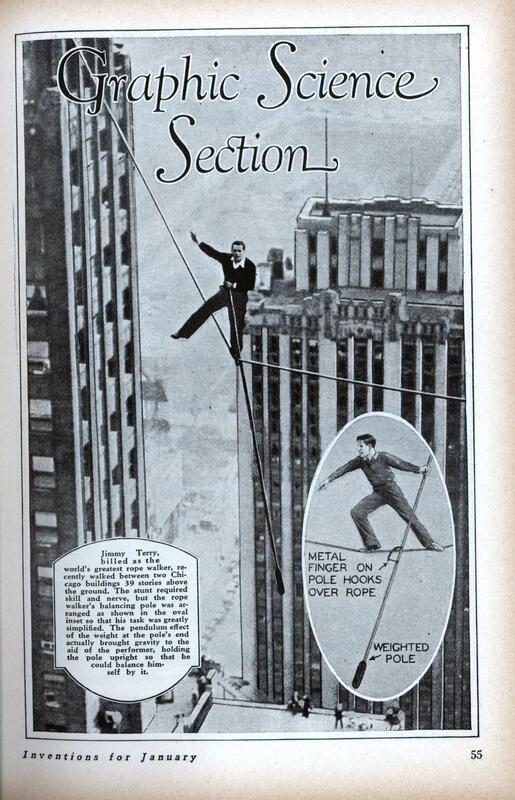 The stunt required skill and nerve, but the rope walker’s balancing pole was arranged as shown in the oval inset so that his task was greatly simplified. The pendulum effect of the weight at the pole’s end actually brought gravity to the aid of the performer, holding the pole upright so that he could balance himself by it. This Chicago house, wrecked when a skidding motor bus struck it, gives a graphic demonstration of the natural forces of inertia present in any moving object. An automobile weighing only 3000 pounds, traveling at 40 m.p.h., exerts a striking force of 2700 tons. This house was struck by a five-ton coach! Scientists tell us that most fruits and vegetables are three-fourths water—even more in the case of the watermelon. Giant vegetables which grow five or ten times the size of their ordinary brothers are usually the result of perfect growing weather in which there has been plenty of rainfall. The squash shown above, exhibited at the Fresno, Cal., fair, weighs 153 pounds. A thunderstorm in the corn belt often means an extra million dollars for the farmers by insuring better crops. Demonstrating the terrific forces pent up under the earth’s crust, a New Zealand volcano recently tossed a 10,000-ton rock 150 feet. The huge rock is shown above, with three figures standing on its top to give an idea of its size. The rock landed directly on top of a homestead, entirely obliterating it. 500,000 horsepower, it is estimated, was expended in moving the rock this distance. Another demonstration of natural forces is presented in the above photograph of the recent hurricane which howled over the country east of Pensacola, Florida. The palm trees are bending before a 102-mile-an-hour gale, while a lone automobile is stranded hub deep in water blown up from the distant sea shore. Meteorologists explain that storms are simply the result of nature’s re-establishing a balance between different layers of the atmosphere where variations in density exist. Using a projector weighing only six and a half pounds, officials of the T.A.T. air lines are now offering movies to entertain passengers in their airplanes. The above photo shows the first airplane movies ever projected. Six reels of comedy and news subjects were presented in an hour and a half during a 10-hour flight between Columbus, Ohio, and Waynoka, Oklahoma. Movies will be shown in all of the company’s planes. The latest idea for comforting the baby and making less work for mother or the nurse is the installation of a phonograph in the carriage, as shown in the above photo. This innovation has become very popular in England, where numbers of special lullabies are being manufactured to lull baby to sleep. Designed to rise absolutely vertically, this novel plane was recently exhibited in England. A combination of golf, basketball, target shooting and several other sports is the new game of “basketball golf” invented by H. C. Alston, of Los Angeles. He is shown in the picture at the right demonstrating how to play the game. A golf ball is driven with a regulation club toward a canvas backstop in which is fitted a ring similar to a basketball hoop. The object is to so place the ball that it will fall through the hoop—not at all an easy thing to do. The ball is automatically returned to the player by a device similar to that used in bowling alleys. Advantages claimed for the game are that it furnishes exercise without the need for tramping over a golf course. 400 individual lenses mounted on this rack will form the reflecting surface of the world’s largest telescope. One lens will be placed in each rectangle of the lattice work. Four are shown in place. The R101, Britain’s New Airship, Passes Its Trial Flights. Five Beardmore engines will drive the giant R101. 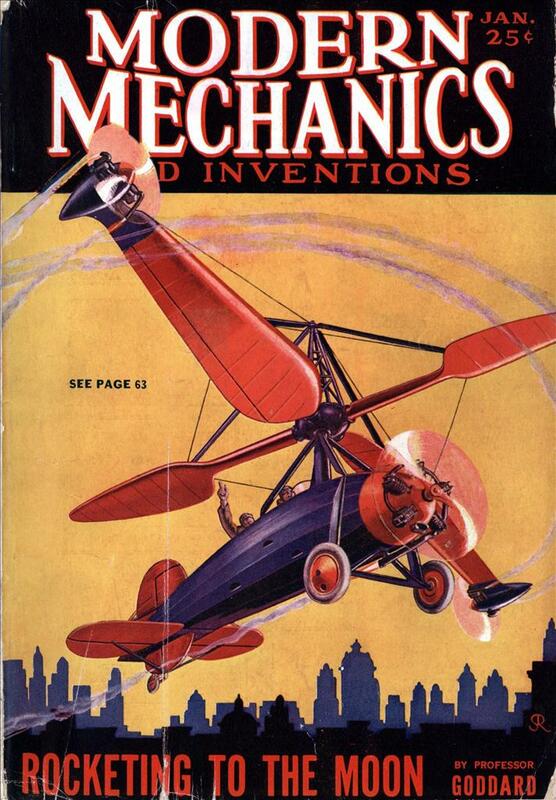 The photo above shows one of the engines mounted in a nacelle or “egg” underneath the airship. These engines will burn crude oil instead of gasoline or gas fuel as used by the Graf Zeppelin. This is expected to make the ship much safer for travel in tropical countries. Having passed its first actual flight tests recently after being more than five years in the building, the new British dirigible R101 is being groomed for a flight to America. The photo above shows a view of the tail of the dirigible. Note that the controls have been moved farther forward on the hull than is customary. It has been found that this placement increases their effectiveness. Major Scott, of the Royal Air Force, who will be navigator of the R101, shown in the control gondola of the airship after its first flight. Dirigible Has Larger Gas Capacity Than Graf Zeppelin. This view of the R101 was taken shortly before it was completed. It shows the nose of the ship with the opening through which the passengers enter the dirigible open for use. The control room gondola had not been installed when this photo was taken. Passengers sit at ease on the observation balcony of the ship, watching the ground through windows. THE WORLD’S LONGEST SUSPENSION BRIDGE, now under construction between Washington Heights, New York City, and Fort Lee, N. J., has progressed to the stage where the weaving of the suspension cables is to be begun. Above photo was taken from the top of one of the 635-ft. towers and shows the catwalk on which four 36-inch cables will be spun. When completed the bridge will cost #60,000,000. It will be 8500 feet long, and will have eight traffic lanes. Behold the pitfalls of a long lead time: by the time this hit newsstands the R101 had crashed, killing most of those aboard. Not quite. 5 October 1930 was the date of the crash. I stand corrected. Dumb mistake to make, too. Thanks for catching it. That’s the George Washington Bridge on page 8, isn’t it?